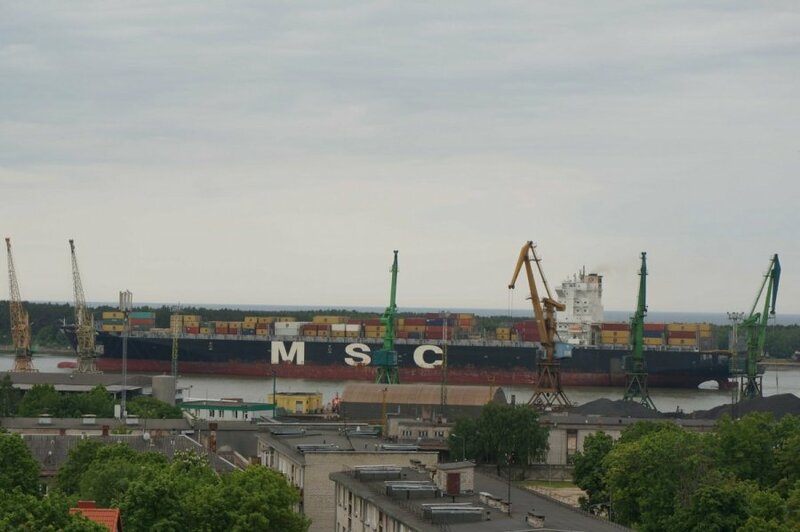 The 324.8-meter-long container ship MSC Charleston, which arrived to the port of Klaipeda, has entered the history of the seaport of Klaipeda as the longest ship ever sailed to Klaipeda and marked the official start of the operation of the distribution centre (hub), reports the Klaipeda State Seaport Authority. "So far, the port of Klaipeda had only been importing and exporting cargoes in containers, but had no a cargo distribution centre. From now on, containers will be brought to the port of Klaipeda by ocean-going vessels-container ships with the capacity up to 12,000 TEU and carried to other ports by major vessels, therefore large vessels from other continents will avoid stopovers in other European ports. 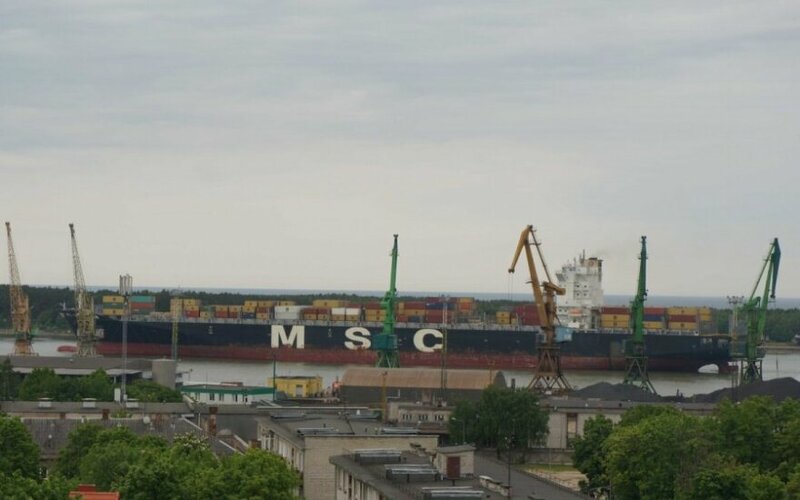 Due to this, the port of Klaipeda will become more attractive and competitive," said the Director General of the Klaipeda State Seaport Authority Arvydas Vaitkus. The foundations for the hub project were laid in 2011; the project was implemented in cooperation between the public and private sectors. The Klaipeda State Seaport Authority, seeking to contribute to the smooth development of the container distribution centre, invested in the port infrastructure exploited by Klaipedos Smelte EUR 56.8 million by 2014 and intends to additionally invest EUR 25.26 million (EUR 3.82 million in the construction of two-level crossing (a bridge) to Klaipedos Smelte and EUR 21.43 million to the preparation of the construction technical project of the embankments No. 97-100 and the works of construction and dredging near the embankments to the depth of 16.5m). "In Lithuania, a project of this kind, carried out with the use of most advanced global engineering expertise, has been implemented for the first time in the history of the port. We are glad that the mobilisation of all forces led to the fact that now the port has a modern and unique container distribution centre with cutting-edge technology, spacious storage sites and new berths with required depths next to them. The implemented project provides conditions to increase the competitiveness of Lithuanian and port's business in the international context, attract new cargo flows directly from other continents bypassing European ports and has created new jobs for high-skilled specialists," said Rimantas Juska, Director General of Klaipedos Smelte. According to Rimantas Juska, in 2014, the number of re-loaded sea containers in the renovated terminal increased by 33 percent - from 132.000 TEU to 176.000 TEU and exceeded the growth of the total container handling in the Klaipeda port by 2.7 times. The total amount of cargoes in containers reached 2.635.783 tons. The first step to establish an international container distribution centre at the port of Klaipeda was made in 2008, when the control package of shares of Klaipedos Smelte was acquired by the international container terminal operator Terminal Investment Limited (TIL). This company owns under the principle of holding about 30 terminals in different continents. TIL closely cooperates with one of the world's largest container shipping companies Mediterranean Shipping Company (MSC) and invests in the development of terminals at the ports which MSC intends to direct the flows of containerised cargoes to.